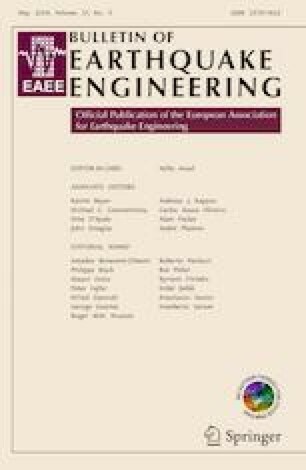 The seismic behaviour of reinforced concrete beam–column knee joints is more complex than the conventional interior and exterior joints due to significantly different closing and opening force actions in knee joints. The strong-column weak-beam design principle is not strictly applicable due to the roof level location of knee joints resulting in weaker columns in terms of their flexural capacity. The general behaviour of knee joints and the effect of eccentricity of the beam axis with the column centre line is not well known due to the lack of experimental test results. Four full-scale knee joint sub-assemblages were tested under reversed cyclic loading to study the effects of the eccentricity of beam axis to column centre line and the ratio of beam–column flexural capacity. Details of the cyclic performance of the tested knee joints in closing and opening actions in terms of shear strength, hysteretic behaviour, joint cracking and reinforcement strain are presented. The test results indicated a relatively weak opening behaviour of knee joints in general. The weakening effect of eccentricity was observed strikingly in opening actions. Stronger columns were effective in improving the opening capacity. The study was supported in part by the Research Grants Council of Hong Kong under Grant Number 16209115.